Along with providing walling for your home, country wide walling also are gate manufacturers that can install sliding steel gates and steel swing gates. We believe in supplying our customers with a fully tailored package to soothe your needs. Why not install a sliding steel gate, or pedestrian gate along with your precast wall. Have a contractor on site, once. Have it done right.... Steel gates have several advantages over other types, such as gates made from wood. The reason is that steel is seen as more powerful than wooden gates, steel is also heavier. Many people rather choose steel gates for their driveways as opposed to wooden gates. If a burglar were interested in breaking in through the garage door, it would be easier to cut through a wooden gate as opposed to a steel one. One of the biggest reasons why people will choose steel when it comes to their driveway, will be security. There are also other factors involved. Making a solid steel structure can be extremely expensive, it also becomes difficult to transport and install. Unless the wooden door has been customized and carved to a certain specification, it won’t necessarily allow people from the outside to see in, while with a steel gate, one can normally get fancy shapes designed on it, which will allow people to see a bit inside a property, this can be a good thing if you want to impress people who pass by, but it can also incite robbers to try and break in. There are several companies which operate nationwide, many of them are responsible all the way from manufacturing the gate to its installation. They not only sell the gate, but they will also offer some sort of gate repair service, should one encounter any troubles in the future. 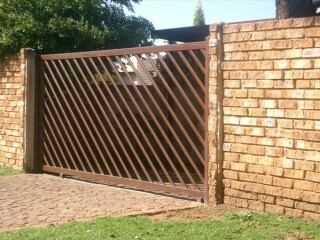 Wherever you are situated in Gauteng, let us install a steel gate with your concrete walls. Have it done right, and ensure your peace of mind.